Please refer to our stock # 3426 when inquiring. 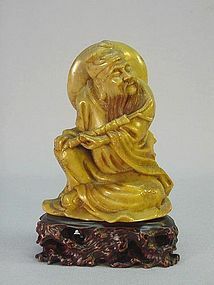 This Shou Shan stone carving of Zhang Guo (or Kuo) Lao is a mid 19th century product. It depicts a seated Zhang Guo Lao. In his left hand, he is carrying his emblem Yu Gu (or Ku) or fish drum which is a tube-shaped bamboo drum with two iron rods. His right hand is resting on his knee. There is a straw hat hanging on his back. The statue is 4 ½” high, 3 ¼” wide (from the bottom) and 2” thick. The carved wood base is not included. The carving is simple and elegant. It is in excellent condition.